We decided to review the Sony KDL-42W651 as it is one of the latest Full HD LED TVs from Sony and it is expected to become quite popular. This 42-inch Full HD Smart LED TV has very elegant design and some of Sony's latest innovations for their LED panels. 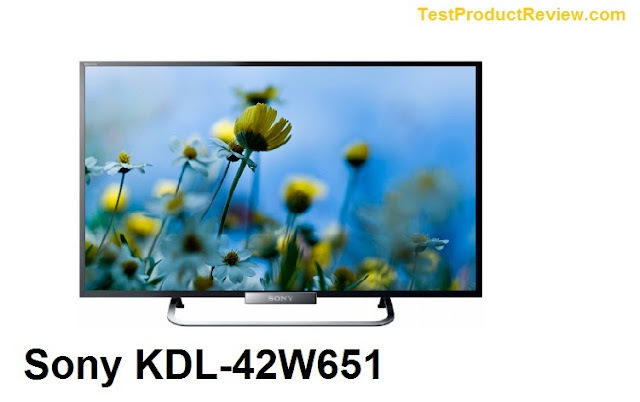 What you can expect from the KDL-42W651 is great picture quality and functionality at a very reasonable price. On fist look Sony KDL-42W651 impresses with its solid looking design and good built quality. Just like most other Sony TVs this one is made of quality materials including good looking hard plastics and metal. The form of the metal stand is new for Sony TVs and gives the KDL-42W651 modern look and feel. The frame of the panel is not the thinnest in the segment but is still quite thin. The design pattern is pretty similar to the of the Sony Bravia KDL-42W650. Sony KDL-42W651 has very compact dimensions measuring 95.4 x 56.8 x 6.9 (1.58 at its thinnest) cm. Though the Sony KDL-42W651 has some pretty good looks its main specifications hide 'under the hood'. Sony are using their X-Reality PRO technology for better picture processing and together with the Motionflow XR 200 Hz and Advanced Contrast Enhancer you get amazing Full HD picture quality. Here we also have 24p True Cinema and CineMotion modes for perfect cinema-like experience. The sound in the Sony KDL-42W651 is also on a very good level thanks to the two quality 5W Bass Reflex Box speakers with S-Force Front Surround 3D and Dolby Digital Plus / Dolby Pulse. Sony KDL-42W651 is a Smart TV with large variety of functions. You can easily connect to the Internet with the help of the built-in WiFi connection and WiFi Direct function. Here we have pre-installed Opera web browser, Skype, Sony Entertainment Network and few other interesting apps. And just like many other Sony LED TVs the KDL-42W651 is absolutely packed with connection options - HDMI, SCART, USB, Ethernet, headphone jack, Component, Composite, D-Sub, PCMCIA, Analogue audio in and few others are available in this TV. And now to the most important part of this review - the price. You can find the Sony KDL-42W651 for around 600-650 Euro which is a very good price for the latest 42-inch Full HD Smart LED TV from one of the most popular TV brands in the world. Of course if you like watching 3D content this one wouldn't be your choice (because it doesn't have 3D) instead of competitor models like the amazing LG 42LA691S 3D Smart LED TV. I would also recommend you to take a look at our selection of Best 42-inch Full HD LED TVs. But what's the difference between this and 42W650? You can consider them the same.